Today Karen and I are running an 18 mile race in New Jersey. We’re not really racing it, but just wanted something fun for our 18 mile training run. I wanted something delicious for my run-eve meal, and with fall in full force, decided to try my hand at something new. 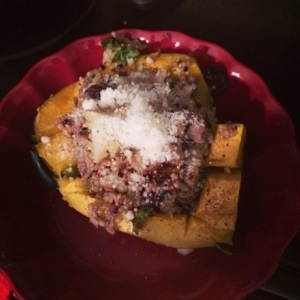 I’ve seen a few versions of stuffed squash, so pulled a little something together with what I had on hand. 1) Heat oven to 350 degrees. Cut in half and clean out squash. Sprinkle with salt and microwave for 1 minute. When finished, put into oven for 10-15 minutes. Top should start to brown. 2) Heat broth in a small pot until boiling. Add quinoa and reduce heat. Simmer, and stir often. 3) In separate pan, heat oil, and add ground turkey. Stir until nearly cooked, then add vegetables, spices, apple and dried fruit. Continue to cook until vegetables are soft and turkey is completely cooked. 4) Take squash out of the oven. Score the squash. 5) Add cooked quinoa to turkey mixture. Then spoon mixture into squash. Sprinkle with pecorino, and drizzle with maple syrup. I never have had Quinoa until now with my new healthy eating lifestyle and it is sooooo good. I really like it mixed with brown rice and stuffed in peppers. I love it! It has such a great flavor and you can do so much with it! That sounds really interesting… especially with the maple syrup and cinnamon!